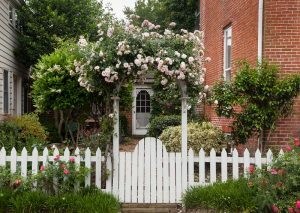 Your garden may look beautiful and weed-free, but your fence may be suffering! They’re lurking in your lawn throughout the spring season. Homeowners distribute them with reckless abandon to keep predators and pests away. Worst of all, they can totally ruin your residential fence. What are we talking about? Weed killer chemicals! If you are keeping the weeds at bay this year with weed killer chemicals, use these tips to make sure that your fence stays safe throughout the process. There are currently products on the market specifically designed to protect fences and fence posts from weed killers, line trimmers, and lawnmowers. These post protectors are typically a metal plate and secures to the lower area of your fence posts, protecting them from harm. These are very easy to purchase and install on your own and will protect your fence posts from weed killer chemicals. Black corrugated piping that is wide enough to secure to the bottom of your fence posts and fencing will protect them from any weed killer chemicals or hits from a weed whacker. Piping can be purchased with a slit down one side or cut on your own to fit the exact specifications of your fence. If you are concerned about the curb appeal of your fence, cut the piping so that it’s only 3-4 inches high so it will blend in more easily. If you love to decorate and customize your fence, purchase ceramic tiles that are as wide as your fence posts. Depending on your tastes, you could choose eclectic patterns or simple colors that will blend right in. Hold the tiles in place with construction adhesive and they will protect your fence posts from weed killer chemicals and lawnmowers all summer long! This entry was posted on Thursday, April 13th, 2017 at 5:39 pm. Both comments and pings are currently closed.